It’s open-windows during the day, almost-cool-enough-to-consider-a-light-cardigan over a tank top at night. These next few weeks? They’re why we put up with 6 months of soul-sucking heat and oppressive humidity. We don’t get acres of beautiful trees ablaze with oranges and reds and golds. 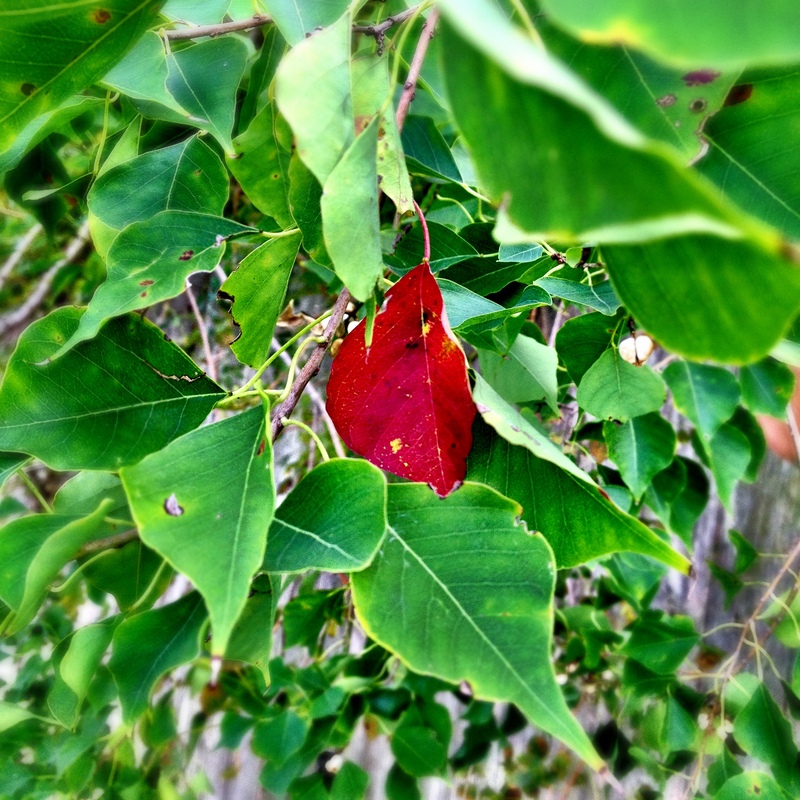 Actually, it would be a lot easier to sum up “fall in Texas” with a single red leaf on a small-tree-sized weed behind the back fence. And you can easily identify those Texans who have been counting down the days for a break from the convection oven weather – they’re the ones who went full-on boots, jeans, scarves, and puffy jackets at preschool drop-off last week at 68 degrees. And returned for preschool pick-up in shorts & flip flops. We’re the ones crowding the patios for dinner under the lights with a pitcher of margaritas and platters of sizzling fajitas at the table right next to the overkill patio heater. The ones with the pool heater on because the water is already to cold to swim without it. It’s all the best parts of spring, only there’s football being played somewhere nearby, 5 nights a week. And beautiful weather calls for beautiful food. These fajitas are the perfect example of how we’ve had a hard time this “fall” getting into heavier, comfort foods. We’re still hanging on a little bit longer before free-falling off the cliff into the creamy casserole canyon. But I have to admit – it’s not that far off. King Ranch Chicken, here we come! 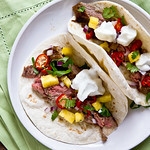 Juicy flank steak tenderized with a fresh pineapple marinade. * If you're using canned pineapple, go with 2 slices and the juice from the can. Place the flank steak in a large zipper bag. Place the marinade ingredients in a blender and process until smooth. Pour over the flank steak, seal the bag, and refrigerate for 20-30 minutes only - do not marinate it longer than 30 minutes. Pineapple is an ultra-tenderizer and it will turn your meat into mush if left in contact too long. While the steak is marinating, chop the rest of the toppings and prepare any sides. Heat your grill or grill pan to high. Cook the flank steak ~4 minutes on each side for medium (~5-6 for medium well). Let rest 10 minutes before slicing against the grain, holding your knife at an angle when cutting. 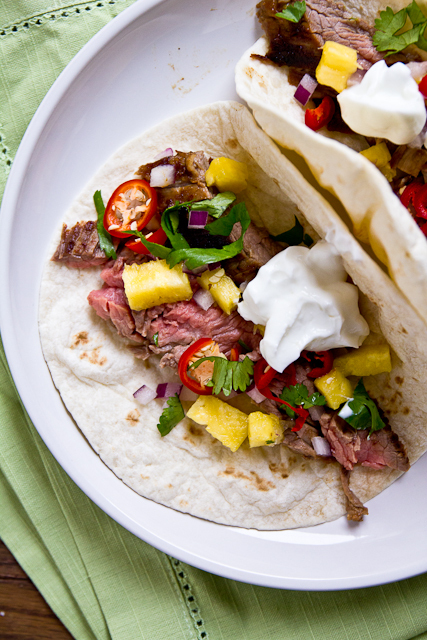 Serve in warmed tortillas, topped with red onion, pineapple, jalapeno, cilantro, and a dollop of yogurt/sour cream. It snowed here today, and it’s nearly impossible to find decent Mexican food this far north, Tex-Mex or otherwise. Remind me why I don’t live in Texas again? you know pineapple juice is the best tenderizer and flavorizer in one. I haven’t done this for years, and since I’m on such a meat kick lately I am using the recipe. Sorry I haven’t been around here much, hope you are well my dear. It’s been in the low sixties here which is abnormally warm for NYC but…I’ll take it! And the fajitas that come with it thankyouverymuch. Hasn’t the weather been incredible lately? 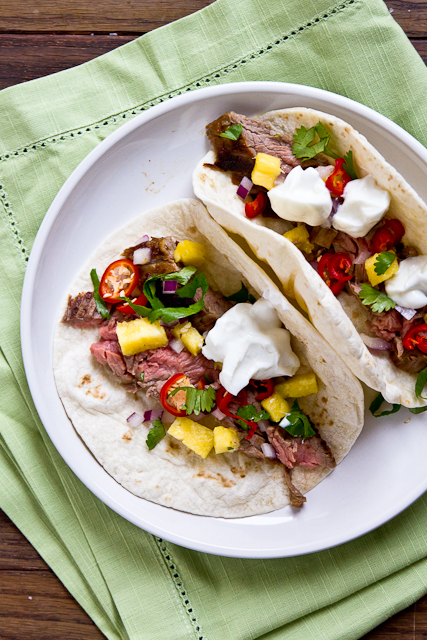 The New England girl in me is rejoicing… the Texas girl in me wants these fajitas, like, NOW! Amazing recipe! I need a reminder of warm weather. I’m just glad it hasn’t snowed yet. These fajitas look delicious! This looks really great, and a friend moved and gave me her canned goods (??) and I have a can of pineapple I didn’t know what to do with (I don’t like the canned version) so here is my answer!! Putting this on the list. Thank you!! Made this last night, and it turned out GREAT! It was my intro to flank steak. Thank you! A keeper!! Found you through Pinterest. Made this recipe last week, delicious!! I post my weekly meal plan on my blog and linked the recipe to you. Thank you for sharing! Do you think that you can use boneless chuck roast in place for the flank steak in this recipe? Or do you think it is too tender of a cut compared to the flank steak? The chuck is cheaper. Let me know what you think. Thanks much. I don’t think it would be a disaster, but definitely aim for the shorter marinating time.